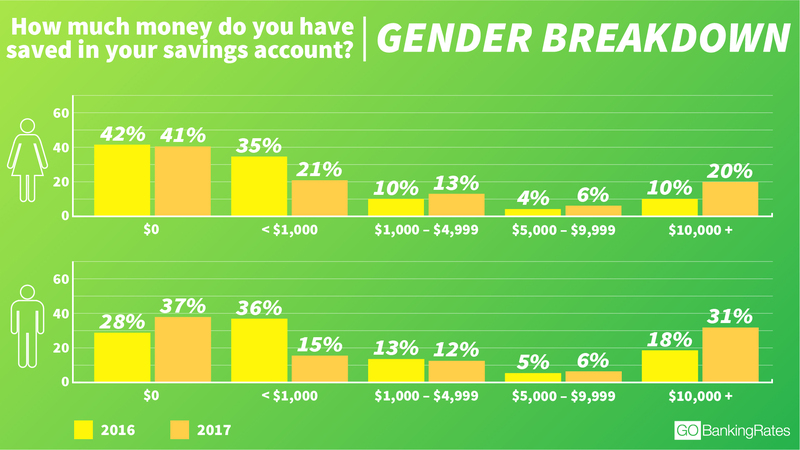 See savings account balances by age, gender and more. For the past two years, GOBankingRates has surveyed Americans to find out how much they have in savings. The results have been disheartening. Last year’s survey found that the percentage of adults with less than $1,000* in savings jumped from 62 percent in 2015 to 69 percent in 2016. This year, the results are both encouraging — and discouraging. Read on to find out how much Americans have in savings accounts. Some Americans who are saving appear to be doing a better job of setting aside cash in a savings account. 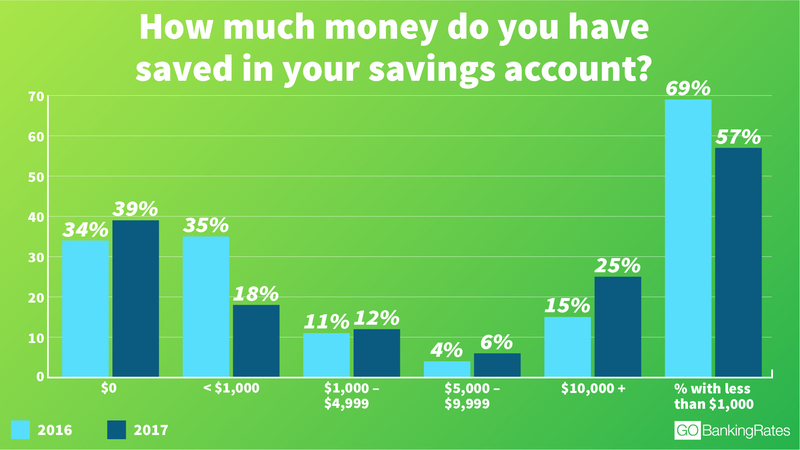 In the 2017 survey, 57 percent of respondents said they have less than $1,000* in a savings account — a decrease of 12 percentage points from 2016 and 5 percentage points from 2015. In other words, 43 percent of Americans now have at least $1,000 or more set aside versus only 31 percent last year. In fact, 25 percent of Americans now say that they have $10,000 or more in saving, which is an increase of 10 percentage points from 2016. This could suggest some Americans are beginning to realize the importance of having money saved, specifically in a savings account. But here’s where the results get discouraging: A growing percentage of Americans have absolutely nothing set aside in a savings account. The new survey found that 39 percent of Americans have $0 saved — up from 34 percent in 2016. That means more people are not financially prepared to protect themselves from one of the many financial disasters that can pop up. 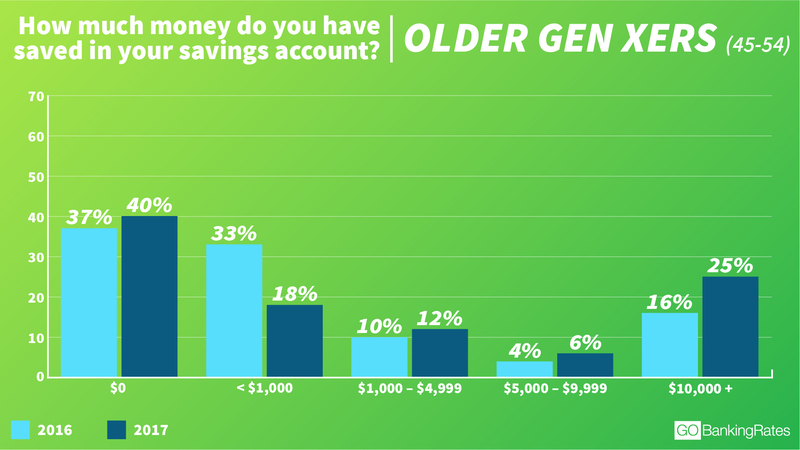 The average (or typical) American savings account balance varies greatly by age. However, one trend is clear from the 2017 survey responses: Savings account balances generally increase with age. Millennials (ages 18 to 34) are more likely than other generations to have nothing saved. And adults 65 and older are more likely to have $10,000 or more in a savings account. Of course, time could play a role. Older adults have had more years to build their savings. However, other factors could explain the disparity in savings accounts across generations. In line with the overall survey results, millennials have gotten both better and worse at saving money. For example, a greater percentage of millennials now have $10,000 or more in savings. And, a smaller percentage have less than $1,000 in savings. However, there’s a growing percentage of those who actually have nothing saved. 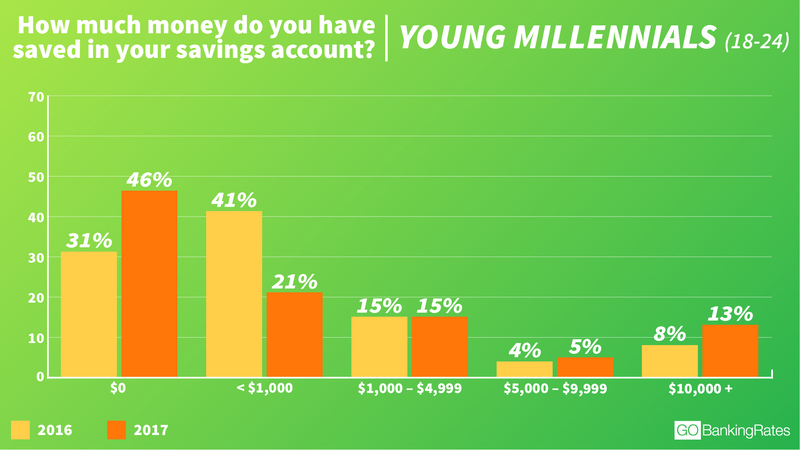 Here’s a look at how much young millennials (ages 18 to 24) have in savings accounts this year compared to last year. 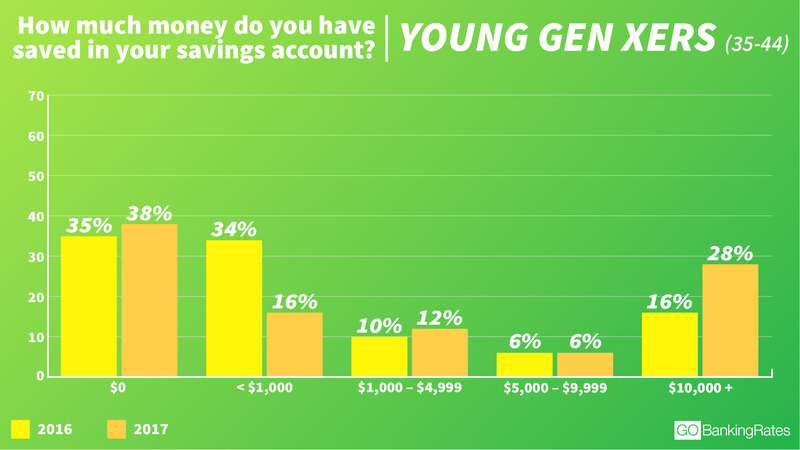 As you can see from the graphic above, the percentage of young adults with nothing in a savings account has jumped significantly — 15 percentage points, to be exact. But on the other end of the spectrum, some millennials seem to be taking steps to increase their savings account balances. From 2016 to 2017, the percentage of younger millennials who have $10,000 or more in a savings account has jumped 5 percentage points. And what about older millennials, those ages 25 to 34? Their savings account balances demonstrate similar year-over-year trends as their younger counterparts. 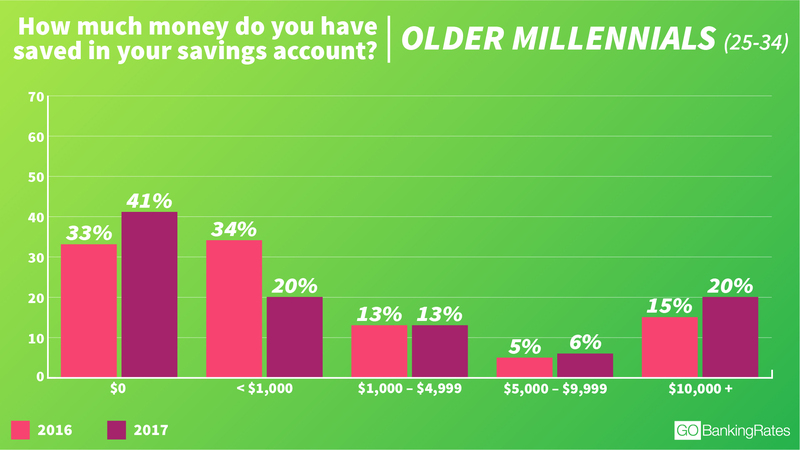 Compared to younger millennials, the percentage of older millennials with $0 in a savings account is lower — and so is the year-over-year change. Still, there’s an increase of 8 percentage points among older adults who have nothing saved compared to last year’s survey. However, some are getting better at saving. This year’s survey saw an increase of 5 percentage points among older millennials who have at least $10,000 in savings accounts, too. So, why is it that a higher percentage of all millennials have nothing stashed in a savings account? It could be a combination of factors. For example, young adults tend to have low starting salaries and a heavy student loan debt, which might be making it hard for them to build savings, said Whitehouse. In fact, GOBankingRates’ 2016 Debt survey found that 36 percent of 18- to 24-year-old millennials and more than 40 percent of 25- to 34-year-old millennials have student loan debt. But, it might also come down to millennials’ saving and spending habits. A separate survey found about half of all millennials are living paycheck to paycheck. Even worse: 72 percent of young millennials and 61 percent of older millennials admit they currently don’t have enough money to cover six months of living expenses. A greater percentage of Gen Xers have $0 in savings compared to last year. But, the increase isn’t as high as it is among millennials. This year, 38 percent of younger Gen Xers (ages 35 to 44) have $0 saved, which is only an increase of 3 percentage points from 2016. And, there has been a marked decline in the percentage of those with less than $1,000 in savings. The percentage of young Gen Xers with less than $1,000 saved fell 18 percentage points this year. But perhaps this is the most encouraging news: There has been a noticeable increase — 12 percentage points — of those with $10,000 or more stashed in a savings account. Now, take a look at the year-over-year changes in older Gen Xers’ (ages 45-54) savings account balances. Again, there was only an increase of 3 percentage points in the percentage of these adults with $0 saved in 2017 compared to 2016. There was also a 15 percentage point decrease of those with less than $1,000 in savings. And finally, 25 percent of older Gen Xers have $10,000 or more in savings — up 9 percentage points since 2016. Baby boomers (ages 55 to 64) have shown significant improvement in their savings over the past year. Although one-third of boomers say they have $0 saved, that percentage hasn’t budged since last year. Meanwhile, the percentage of those with less than $1,000 saved has fallen 20 percentage points from 2016. And, the percentage of boomers with $10,000 or more saved has nearly doubled. 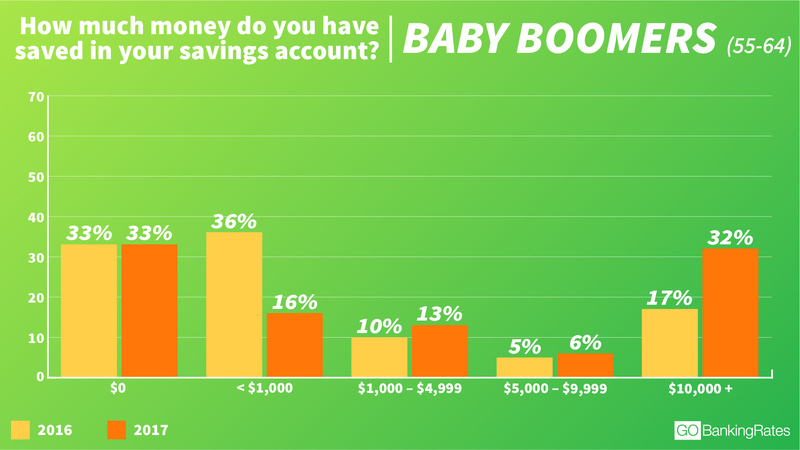 Perhaps these results give more insight into boomers’ retirement savings habits. In its 2017 Retirement Savings survey, GOBankingRates found that nearly 30 percent of boomers ages 55 and older have nothing saved for retirement. However, when compared to other age groups, a greater percentage of boomers have at least $300,000 saved for retirement. But, do they have enough saved to truly retire comfortably? Only time will tell. Seniors (ages 65 and older) appear to be doing the best job of saving money. 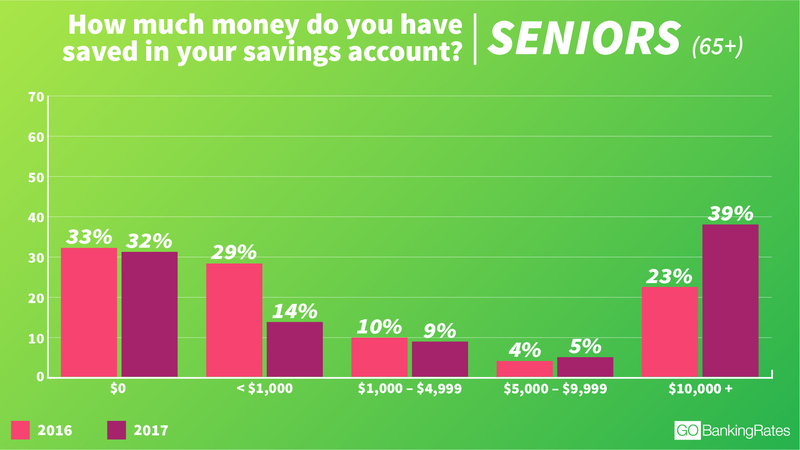 At 39 percent, this age group has the highest percentage of respondents who said they have $10,000 or more in a savings account. Plus, that’s an increase of 16 percentage points from 2016. There’s a slightly smaller percentage of seniors than any other age group with $0 saved — 32 percent, which is essentially the same as 33 percent in 2016. Still, the percentage of seniors with less than $1,000 saved fell about 15 percentage points. Women have made significant improvements in saving money over the past year. 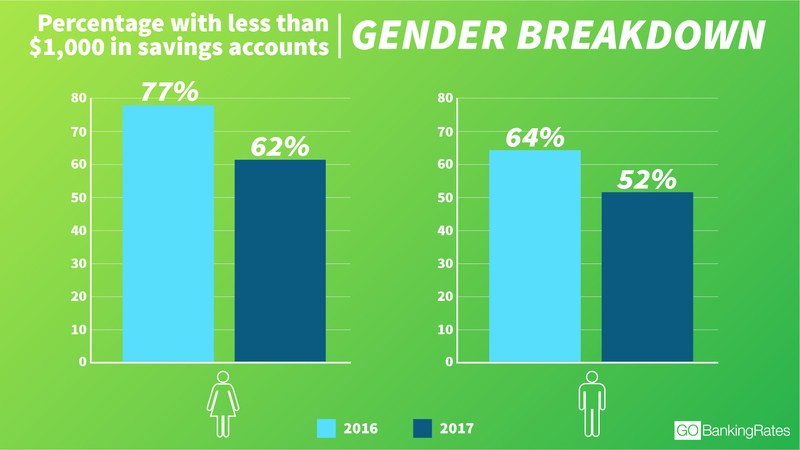 Today, 62 percent of women say they have less than $1,000* in savings accounts versus 77 percent in 2016. There is also a smaller percentage of men with less than $1,000* this year compared to last year. 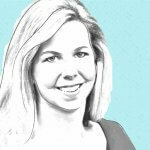 Additionally, women appear to be slowly closing the gender savings gap. When comparing the percentage of men versus women with less than $1,000* saved, the gap was 13 percent last year. This year, it fell to 10 percent. Meanwhile, the percentage of women with $10,000 or more in savings has doubled from 10 percent in 2016 to 20 percent this year. However, this year’s survey found women still lag behind men in this aspect. The new survey found that more men have $10,000 or more saved when compared to women. And, the percentage of men with less than $1,000 saved has fallen 21 percentage points this year. Among women, this fell only 14 percentage points. The difference between men and women’s savings account balances might be explained by the income gap. However, it’s worth noting the gap is also closing between the percentage of men and women with $0 saved. Now, 37 percent of men say they have nothing in savings versus 28 percent in 2016. The percentage of women with $0 saved is essentially the same this year as in 2016 — 41 percent versus 42 percent. Financial experts typically recommend having an amount equal to six months’ worth of expenses in a savings account that can be easily accessed if an emergency strikes. You don’t have to set aside that much at once. You can start small, but the key is to make saving a habit. Methodology: This GOBankingRates.com survey posed the question, “How much money do you have saved in your savings account?” to 8,131 people among all 50 states and Washington, DC. Responses were collected through a Google Consumer Survey conducted from Aug. 15, 2017, to Aug. 17, 2017, and responses are representative of the U.S. online population. For some graphics, percentages will not add up to exactly 100 percent because the figures were rounded up. *This figure is combining the percentage of those with $0 saved and those with less than $1,000 saved.